You are currently browsing the tag archive for the ‘Gentle Giant’ tag. Since the beginning of December I have been painting the largest mural of my career at the Fulbridge Academy, which I have affectionately referred to as my ‘Sistine Chapel’ project. When Executive Head Josie Milton asked me last November if I would work with both Warmington and Titchmarsh Primary Schools “in March” to lead some drawing workshops and to produce a mural for the Titchmarsh School library, never in my wildest dreams did I think that the Fulbridge project wouldn’t be finished by the time that date came around. Therefore, in order to fulfill my promise to Josie, I have taken a 3 week sabbatical from the ‘Sistine Chapel’ and I will return there later this week. I have changed place and scale from one extreme to the other, the contrast couldn’t be more different. At Fulbridge I’ve spent 10 weeks clambering up and down scaffolding working in a space that, despite its appearance, would be better described as a ‘break out area’ than corridor whereas the intimate surroundings of the library corridor at Titchmarsh is another world completely. It’s cosy. Very cosy. I’ve always received a warm welcome at Titchmarsh and it’s felt good to be working there again. At the end of last week I spent a day filling walls in the library area with pencil scribbles and during the last 3 days have been applying paint. 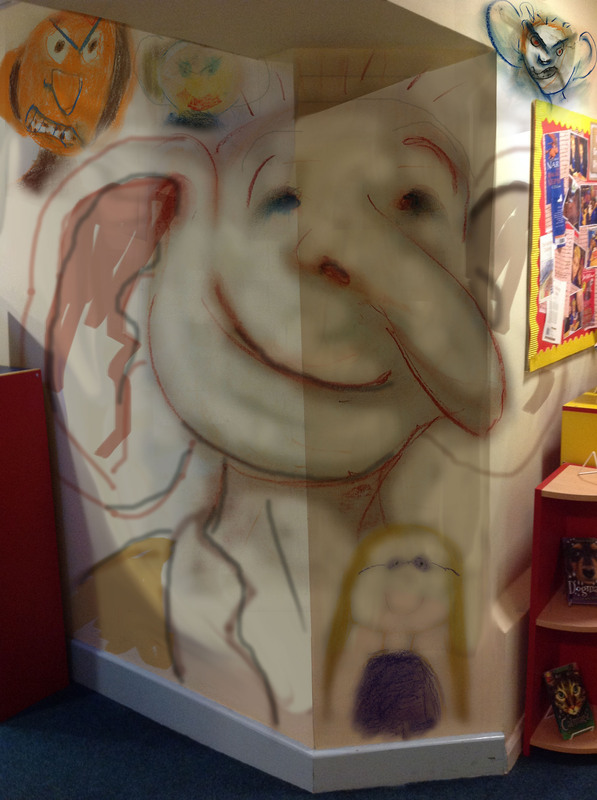 One side of the library corridor now features a large BFG, a small Sophie by his side, surrounded by 9 compadres from Giant Country and all the characters were designed by children during the drawing workshops. The walls facing it, designed by myself, comprise of a variety of well known individuals from other Roald Dahl stories. A library area which last week had some ordinary and plain coloured walls at its entrance, now has a very colourful, exciting and stimulating atmosphere. Hopefully the paintings will encourage the reading of some magical and imaginative stories too! I’ve altered my ‘song title = blog title’ habit this time and decided to include the group to whom the track belongs as well, the combination of the two couldn’t be more apt. During my teenage years it was my good fortune to be surrounded by some terrific music and my soundtrack of choice tended to lean heavily toward the progressive rock idiom. Therefore, considering this entry is a reflection of two mural painting projects, the first based upon the book ‘The BFG’ by Roald Dahl and the second an interpretation of other stories by the same author, what better choice could I have than to remind the world of the lesser known but nevertheless wonderful Gentle Giant. Vivid memories of reading bedtime stories to my daughter Maria many years ago were obviously also dancing around in my head – and what great memories they are – so I had the perfect track title to use too. Earlier this week I presented drawing workshops to children at both Warmington and Titchmarsh Primary Schools, details of which can be found by clicking the appropriate school, and a selection of the drawings produced were to form the basis of a mural for the Titchmarsh School library. During the last couple of days I made a selection of the drawings I felt would work well within the context of a mural inspired by ‘The BFG’ book and developed a design using Adobe Photoshop to present to Executive Head Josie Milton. Following our discussion of the proposed design I made a few alterations and today began the process of transferring it to the wall. The second painting, located on the opposite wall, was a late request as a mural project and so appeared as an improvised composition during the second part of the day. Josie asked if I would produce a companion piece to the main project which would reflect a selection of other familiar Roald Dahl stories, so I have chosen to include James and the Giant Peach, Matilda, George’s Marvellous Medicine, Fantastic Mr Fox, Charlie and the Chocolate Factory, The Twits and The Witches.